The beauty of this world and the mysteries behind every culture are two of the many things that inspire me to travel. The curiosity to understand what others had left behind for us to enjoy or learn. The perfection of nature and the details behind its beauty, blows my mind away. These are just a few pictures of what I have seen. Because of these inspiring pictures I want to see more. I love to know that there is a lot more to see in my journey and while I discover more and I will be sharing it with you. I love to travel, and until now I always had created my own adventures which require a lot of work before traveling. I enjoy putting the puzzle together. Experience had thought me, that even though my husband and me enjoy our freedom when traveling, also is exhausting at the end of every day. For once I wanted to experience traveling without any effort from my part. So here is our experience in Iceland and Ireland. Two magnificent destinations with two different approaches on our vacation. We started our adventure getting earlier to the airport at Reykjavik, than our Gate One tour group. Gate One called me the previous week to advise me that our tour guide was going to be at the airport around 7 a.m. , our flight landed close to 5 a. m. . We found a very up beat coffee shop ready to serve to all those passengers, including us, getting off the plane at that lovely time in the morning. Around 7 in the morning, we looked for our tour guide and we encounter few Gate One tour guides with their sign up waiting for their guests. We went one by one until one of them found our name in her list. She gather the rest of the group and soon enough we were in a very comfortable coach bus on our way for breakfast at Harpa Concert Hall and a full day itinerary. There was no time to rest, but while the driver was driving and our eyes close involuntary. I think that was one of the greatest things of not been in charge, I didn’t have to worry where to go, they just took us. After touring a little around the city they drove us to the hotel at Hella that was out of the city, basically in the middle of nowhere. Finally we were able to rest and later we met for dinner with our tour guide and the rest of our group. Our room was very simple and rustic, but very comfy and warm. I loved the super hot water! The next day our adventure started with included breakfast at the hotel. Our bus was waiting for us perfectly on time. Jorge and me were one of the first ones and we got the front seats. We loved it because we were able to see everything like in 3-D. We toured along the South Shore. The scenery was fill with spacious white valleys and mountainous horizons. On our way we saw one of the most famous volcanos Hekla, the country most famous volcano and Eyjafjallajokull volcano. We stoped at two different waterfalls, they were both beautiful. It was a great experience but because we were on a schedule we didn’t have much time to stay in each. Also we have to consider been on time at the bus because we were not the only ones in the group. Its incredible how organize the tour guide have to be for not to loose any one. Not everyone follow instructions. We visited that same day a museum of how life was for Icelanders on old times, we had a lovely lunch in another hotel, we visited the Volcano Visitor Centre and had dinner at our hotel. We did so much in one day that it seems unreal. I know now for experience that the only way of doing so much in one day is having a strict schedule and of course been guided by someone that knows the area and that speak the language. Our tour guide and bus driver were a great team. While we were driving to different places, me and Jorge took naps, posted pictures on social media or simply relax until we arrived at our new destination. The next day we packed all our belongings because we were going to change hotels at the end of our day. We started visiting the geysers area, with the famous Strokkur Geysir that erupt every few minutes spewing hot water into the air. We continue with our schedule visiting the Golden Waterfall at Gulfoss, what an impressive waterfall. Was completely different of the ones we visited before. We then had lunch at the family-run Fridheimar Greenhouse, where they grow delicious pesticide-free tomatoes and cucumbers with the aid of the geothermal heat. I have to highlight again and again, we where able to accomplish so much in one day and learn so many things because of Gate 1 arrangements. The lunch was lovely, great tomato soup and tons of home-made bread. Our last visit of the day was at Pingvellir National Park, where there is a canyon that runs through the park that have the dividing fault line between two of the earth’s tectonic plates (Mid-Atlantic Ridge). We hiked there like for an hour. Nature is amazing! The beauty of this place is hard to describe, is kind of exotic and peaceful at the same time. Even we had such an active day we were looking forward for night time to continue our quest of finding the Northen Lights. It was raining and very cloudy but our tour guide knew exactly where to take us so we could have the incredible experience. And so we did. It was my first time photographing long exposure. It took me a while to play with the settings of my camera until I got it. The Northern Lights are breath taking and worth to wait in the middle of the cold night to see them. Next day was our last day adventuring in Iceland with our Gate 1 tour group. 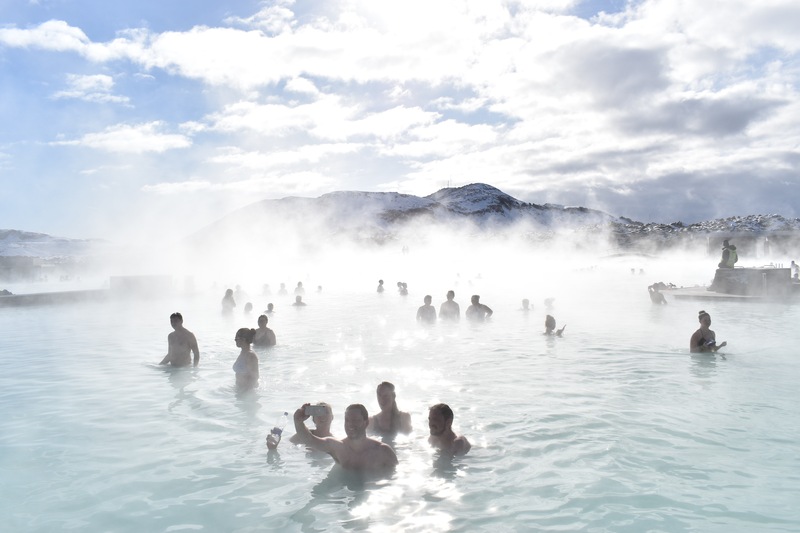 We went to the the famous geothermal pools in Iceland, Blue Lagoon. This was an amazing experience that probably was going to be difficult for us to schedule without the help of Gate 1. Once again we enjoyed the privilege of seeing a great wonder without no effort. Apparently the lines to enter to the Blue Lagoon are eternal, unless you are in a tour group or if you schedule with a lot of anticipation. Nevertheless we enter effortless, we were able to melt away in the frost like color and warm water for hours. The next day we flew to Dublin, Ireland. That adventure we did it on our own and I can tell you that it went very different that the one in Iceland. It was super fun but we had to do everything. I decided to make the Ireland story in a different post because I don’t want to make this post any longer than it is.